We’re often asked whether or not all the pieces of a wedding stationery suite have to match. The answer is, well, yes and no. Yes, in that every piece should reflect the feeling a couple is trying to create surrounding their wedding. No, in that not every piece needs to be “matchy matchy” (though it’s certainly okay to make them so). 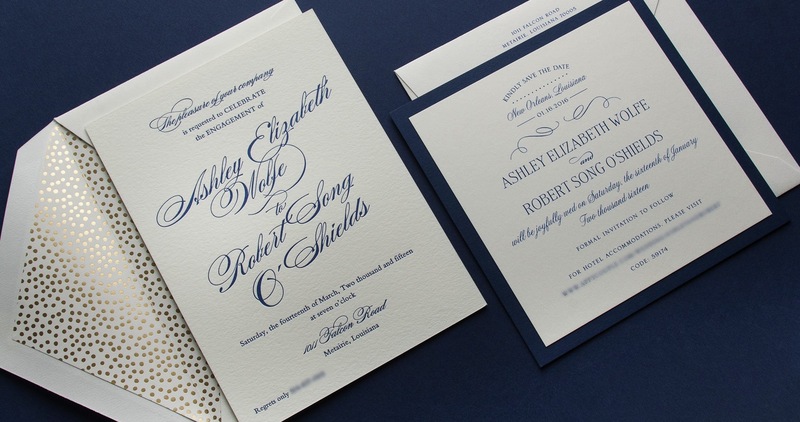 In the case of Ashley and Robert’s wedding, what was important to Ashley was that her favorite color—dark blue—be incorporated. And so, the engagement party and save the dates both feature the vibrant hue. (The invitations will also follow suit.) However, Ashley , with the help of her stationer, Gem Printing, added subtle touches to make each piece unique. For example, the engagement party invitation was paired with a festive gold dot envelope lining and the save the date is a square shape. 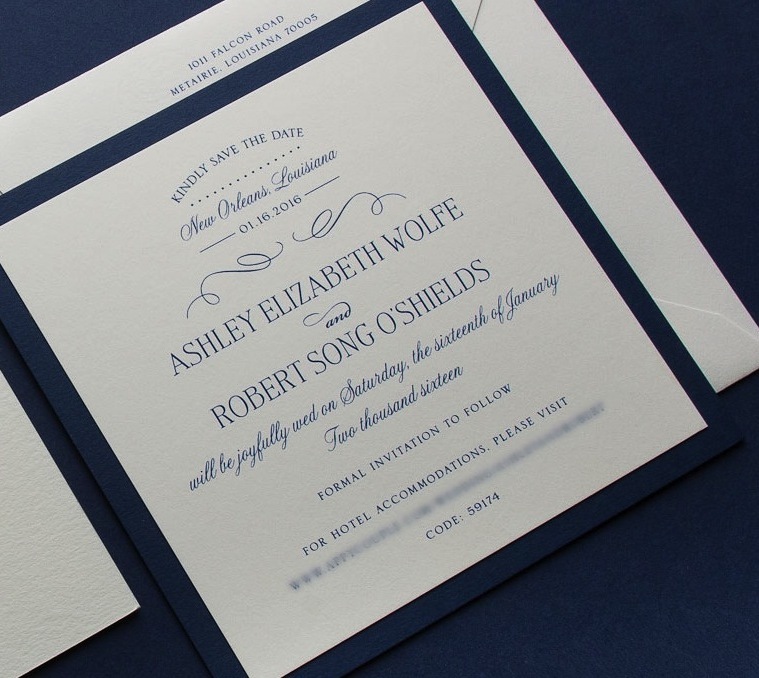 Here, Ashley shares the touching reason why she wanted to go overboard on the engagement party invitation, and Melissa of family-owned Gem Printing talks about the unexpected detail today’s brides seem to know all about. We met at a mutual friend's birthday celebration. Our friends were baffled that we had not come across each other before this party. Not only because we knew most of the same people, but also because of our love of sports! We hung out as friends for almost two years before taking the leap of faith to try a relationship. Now, we both feel it was the best idea ever. 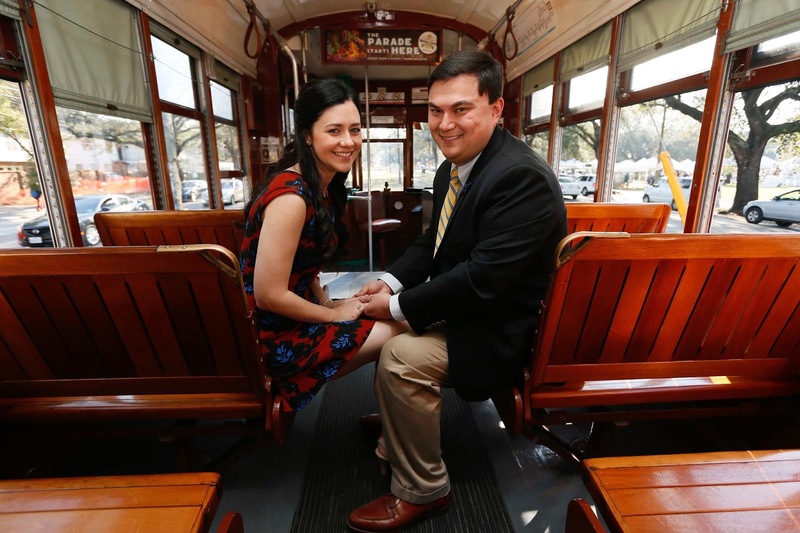 Robert's mom lives out of town, so he chose Mother's Day to pop the question. 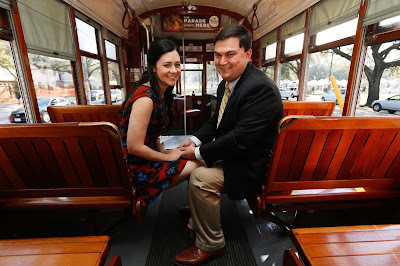 With an elaborate plan at hand, our families had me running around all morning until finally I accidentally walked into my proposal, which surprised Robert, but worked out for the better. While I was running around, Robert was at my house hanging photos of all of our adventures together—travels, games we attended and concerts. After we startled each other, I walked down the hallway toward Robert, and that is when he got down on one knee and asked me to marry him! Of course, I said yes! My mom and I love paper, cards and stationery, and have saved invitations over the years. We both felt that this was the time in life to pick out what we loved. We had some idea of what we would choose, but it really came together at our first appointment. My favorite color is blue, and it was important for me that the invitation was a darker blue. Luckily, William Arthur had a beautiful blue that we chose. The engagement party was a very special time because my grandmother was healthy enough to enjoy the party. The invitation definitely set the tone for a mini wedding type party. Sadly, she won't be physically with us on our wedding day, but we went a little overboard for the whole event to make it special for her! The save the dates were what I probably worried about the most, and they were really fun to design. I love the way they turned out. My parents hosted our engagement party at their home. We wanted it to really set the tone for what was to come, and we knew this would be the event to make that happen. We basically picked a sample wedding invitation, changed the wording a bit, used our regent blue, picked the soft white paper and picked a beautiful envelope liner. The liner was so fine! Gold champagne bubbles to compliment the blue wording. The neat part about this invitation, too, was that our names were diagonal in the center and in a different font! Loved it! For the save the date, we knew we wanted to stick to the blue theme. We wanted to change it up with the shape since the wedding invitation will be a rectangle but larger than the engagement party invite. We chose a similar design to one of the examples but a different paper to make it fun. The blue border really made the save the date look finished and I adore the font changes within the piece. I knew there would be many decisions to make, but I definitely got caught up in the details. The color of the paper was an expected element that I didn't think I would have grappled with as much as I did, and in the end we loved the soft white we chose! We were able to make my vision come true by adding something special to set the tone for our big day. 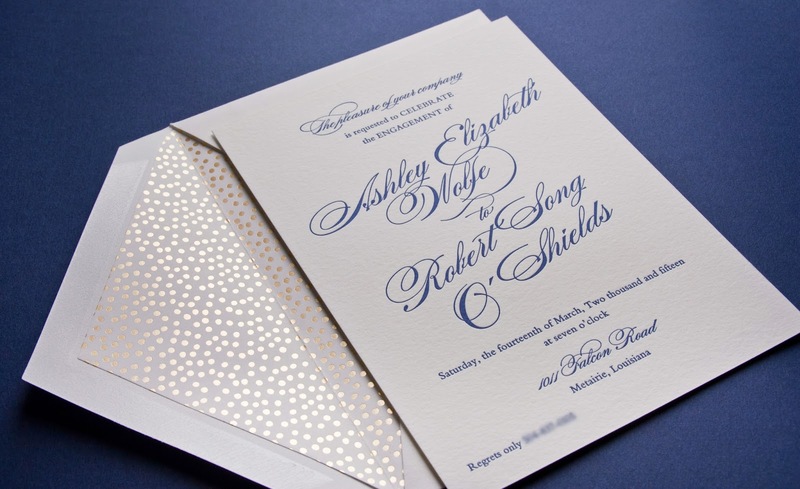 For example, I loved that our names were offset on the engagement party invitation, and the gold champagne bubbles on the envelope liner. But, also the design we chose for the save the date exceeded my expectations! My advice to brides-to-be is go with your gut feeling and choose what you want. After that it will come together beautifully! I can't wait for two parts: I am looking forward to dancing with our family and friends, but most of all I can't wait for the church doors to open and walk down the aisle with my dad towards Robert! Ashley and I grew up together. We’ve known each other since the fifth grade. In fact, I’m I standing in the wedding. I’m truly honored to be one of her bridesmaids on her big day. Ashley has very classic and clean taste, and wants everything perfect (which is not a bad thing). She came in knowing that she wanted William Arthur invitations. The thickness of the stock is very important to her. First, we decided that the white shade fits the theme of her wedding, while the blue ink adds just enough playfulness and gives a festive yet formal feel. We’ve carried this theme over with the engagement party invitations, save the date and will do so with the wedding invitations. Always go to a reliable retailer. We’ve been around since 1918, so we’ve seen our fair share of stores go in and out of business. 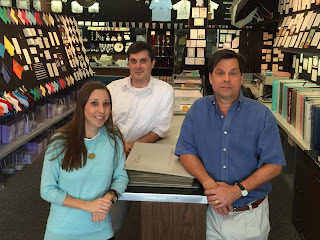 Experience is something you need to have in order to walk a bride through the ordering process. There are a lot of choices to be made (wording, ink, envelope liners, etc.) and having a trusted and knowledgeable sales person is key to making the process smooth. Are you a bride or stationer who would like your William Arthur or Vera Wang wedding invitation featured in our Real Weddings series? Email us at concierge@crane.com!